This year we play the 158th Annual San Francisco St. Patrick’s Day Parade and Festival on Saturday, March 14th. That’s exciting! 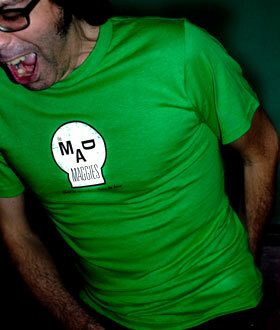 Our kelly green, skull t-shirts are the perfect attire for such an occasion. If you live in the Bay Area and order by 3/10, you could have a shirt just in time for the big day in SF. The’re on sale for only $10.50!! And that’s a crazy good deal. The parade starts at 11:30 am at 2nd and Market and winds it’s way down Market to the Civic Center Plaza. We’ll be on the Plaza Stage at Larkin facing City Hall from 1:00 – 2:30. We’ve got some musical treats cooked up including a mad rendition of Wild Rover and a song I’ll be singing “as Gaeilge” (in Irish). Hope to see you in the crowd of green bedecked revelers. This is a family-friendly, free event. green, San Francisco Civic Center, St. Patrick's Day, Steven Restivo Productions, Stew Murrie photographer, Unitied Irish Societies of San Francisco.